This is something new for me. Writing this from within the WordPress app on my tablet. She did what she had to do in the kitchen and was perfectly happy with a cup of tea and a ‘Jamette’ biscuit. I think they were made by Bakers or maybe Pyotts; either way they’re no longer made. My Dad was always disgusted that she disliked fruit. He was horrified that she would only eat a banana if doused with cream! These days, I would tell her to ditch the banana and swig the cream! While I am perfectly capable and can rise to an occasion in the kitchen, I frequently find something, IMO, better I would rather be doing! I admire immensely those Banters/low carbers who are prepared to spend hours in the kitchen cooking up a storm. Fortunately, WJJ & I are very relaxed about eating and we’ll mainly dish up meals that are nutritious yet often simple to the extreme. Herewith an example brekkie or lunch. Portable too. Sardines on toast. Nothing gourmet there but a good light meal if Banting. Surprisingly filling. Next time I will have only one toast, not two. Before Banting, we would have scoffed white hamburger rolls stuffed with this tuna mix. We didn’t even miss them. 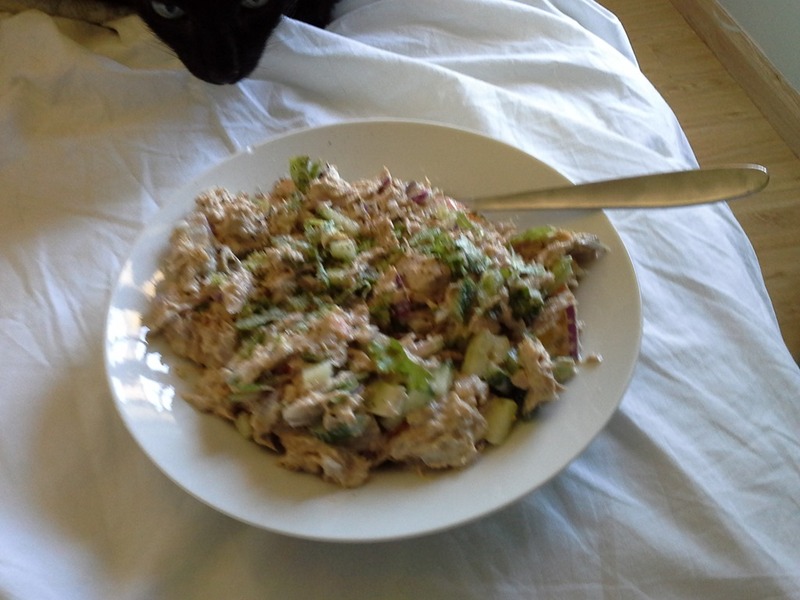 425g can PnP Chunk Tuna in Brine; finely chopped green pepper, red onion, tomato, cucumber. Lashings of home made mayo, salt & pepper. I really battled to finish mine and took several hours to do so. A planned electricity blackout is due in our area this evening so we’re sorted for the rest of the day! Banting needs no fancy recipes nor special foods. Just good clean simple food; the best quality that your budget allows.